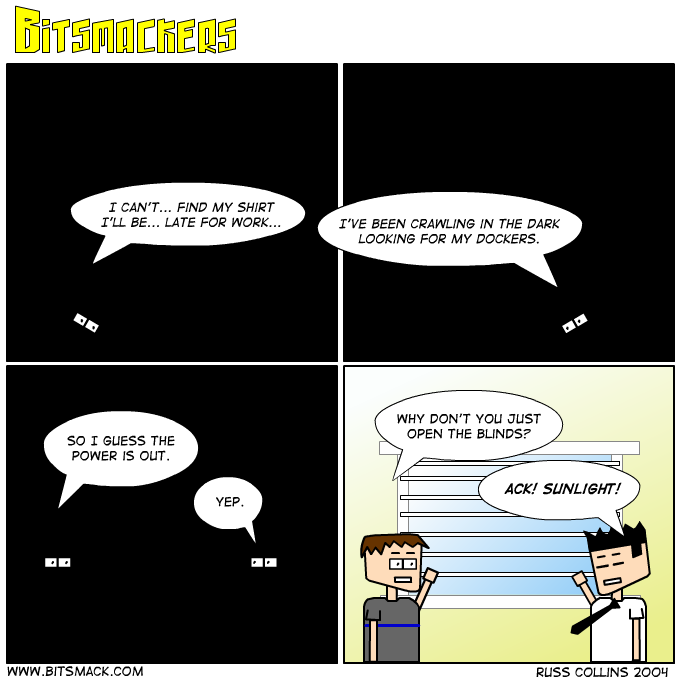 Here’s <a href=http://www.bitsmack.com/modules.php?op=modload&name=Comics&file=index&action=comic&id=437>part 2</a> of our ongoing story. I have a long rant I want to make but its late because I’ve been playing World of Warcraft. So maybe I’ll post it in the morning. Good morning. If anyone has ever wondered why I play console games more than PC let me describe for you how I spent Tuesday night. Brad picked up two copies of World of Warcraft because I thought it was finally time to try one of these MMORPGs that are so darned popular. The game comes on four discs and I started installing about 6:30. I wish I would have timed it to see how long it took, but once I got through all four discs I had to download the latest patch. This was about 55MB and even though they use torrents it still took a long time. Even after it finished downloading it still took several minutes to install the patch. By the time I got to the point I could actually play the game it was about 9:30. But there was a catch, I still couldn’t play the game. When I tried to create a character the models weren’t showing up and I had all kinds of graphical crap everywhere. Since I am on a Mac I don’t have to download updated video drivers because they are included in each OSX update. Luckily the next day Goz found on the forums that there was a video setting I could change that would fix the problem. So in all it took me several hours to play a game whereas on a console I just have to put in a disc. Now I know I said I was on a Mac but in the past I have had even worse problems in PC gaming. I seem to remember one game that didn’t work with the most recent video drivers so I had to install old video drivers. Maybe if you have a top of the line PC you don’t have as many problems with games but you still have to sit through the install and patching process. That being said World of Warcraft is a really sweet game. You can get a bunch of quests and do them in whatever order you want. You can explore pretty much anywhere. I guess the only thing I have to compare it to is City of Heroes that I played for about a week. I liked the character creation and the super hero theme of CoH but I think in the long run WoW seems like there is more to do and won’t get redundant as fast.